I’m feeling a little cheesy this morning 😯 . Okay, so maybe not exactly cheesy, but who doesn’t love cheese? And apples? Especially in Fall, when apples are at their peak in the North and cheese slides in as a savory partner. I never quite got the whole “slice of cheese on the side of apple pie” thing until I got older. Did your grandma do that? I still don’t do it, but I do understand it better as in my taste buds totally get it. My only issue is that we have to watch our saturated fat around here due to a family history of high cholesterol and heart attacks. 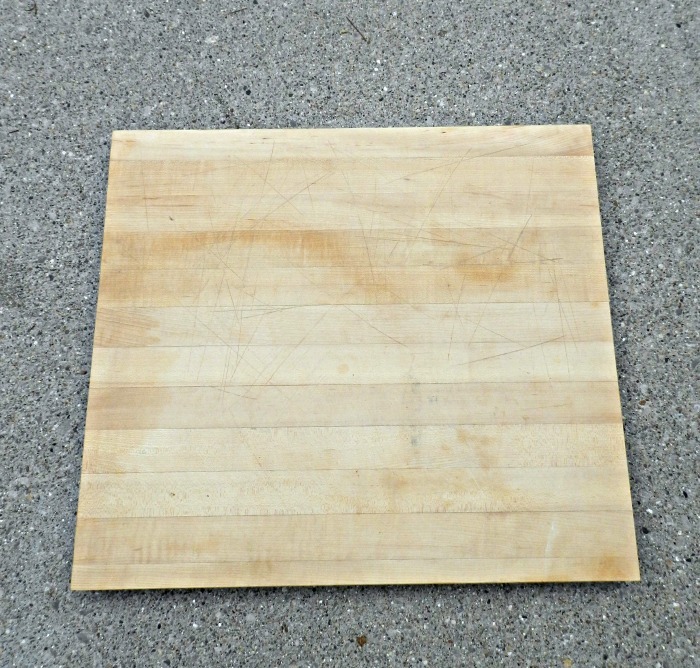 So, today I am sharing this “Cheese & Apple Butcher Block Tray” which I think is a pretty healthy idea as long as you don’t go overboard with that beautiful cheese. When we moved into this old house, this HUGE butcher block was inserted inside one of the kitchen drawers so it would slide over the utensils and could be used as a pull-out cutting board. Cute idea? Yes. Functional, NO. The problem was that there wasn’t enough room under the butcher block to put my utensils. It was ridiculous. So, I pulled it out (it actually slid out very easy) and used it on top of the counter for a little while until I figured out that it was way too big. Washing this thing was a nightmare on Oak Street. 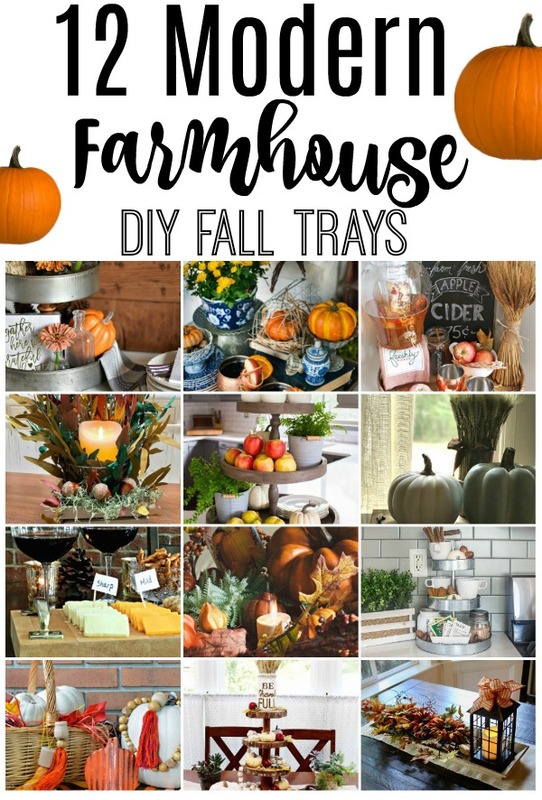 So, when I was invited to join my blog friends for a “Fall Tray Blog Hop” my husband (I was shocked he remembered) pulled this out of the garage. He knew I was looking for a “tray” and thought I might be able to figure something out. We cut that baby in 4 pieces. My husband measures and cuts really well, so while I can come up with the idea, I couldn’t cut this alone. Please do not try this yourself unless you are very experienced. FYI: hardware stores will cut wood for you. 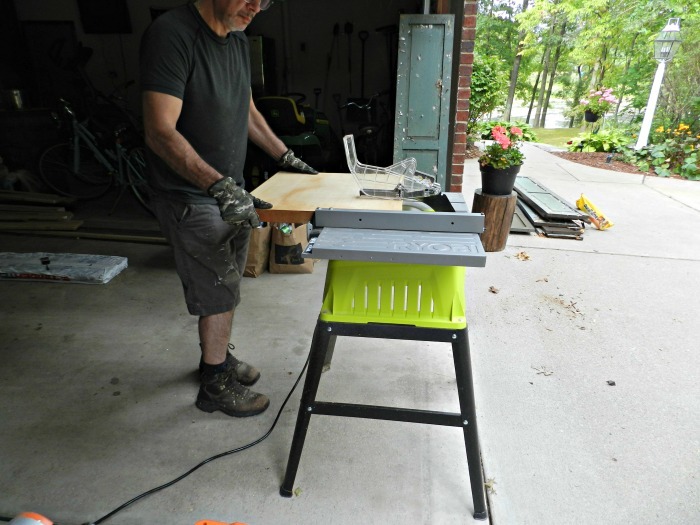 TIP: You will need a strong drill bit to get into that strong butcher block if that is what you are using. Then the fun part came. Putting all of the cheese & apples on it was a delight. I ate one slice, put one down. Ate one slice, put one down. You get the idea. Uh oh. Who put that photo in there? Shh…only the folks that really read my blog post will know that the rustic wreath in the background is coming up next week. You won’t believe what that is made out of. Cheese is my favorite way to entertain! Julie, you are your husband are a great design team! I love how you revamped your butcher block. The handles are a brilliant addition. What a brilliant idea! 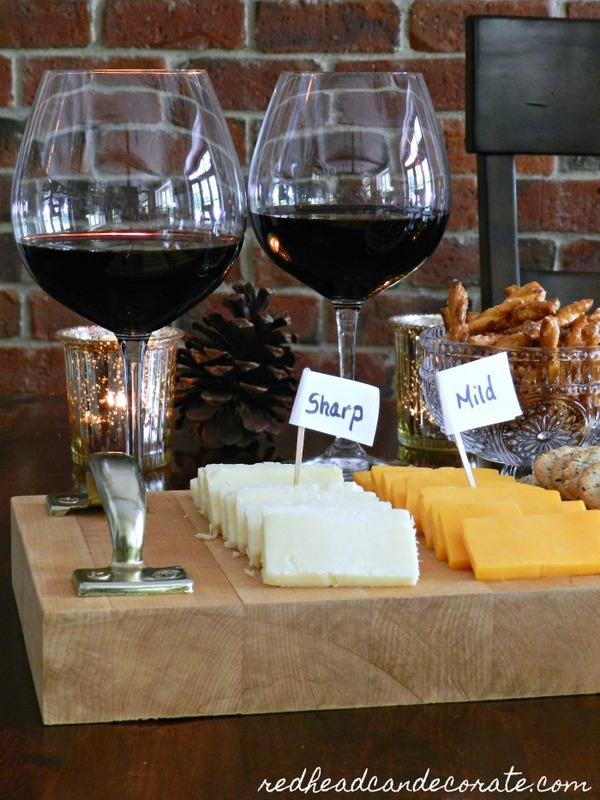 This cheese tray is perfect Julie, says this wine-and-cheese-loving gal! 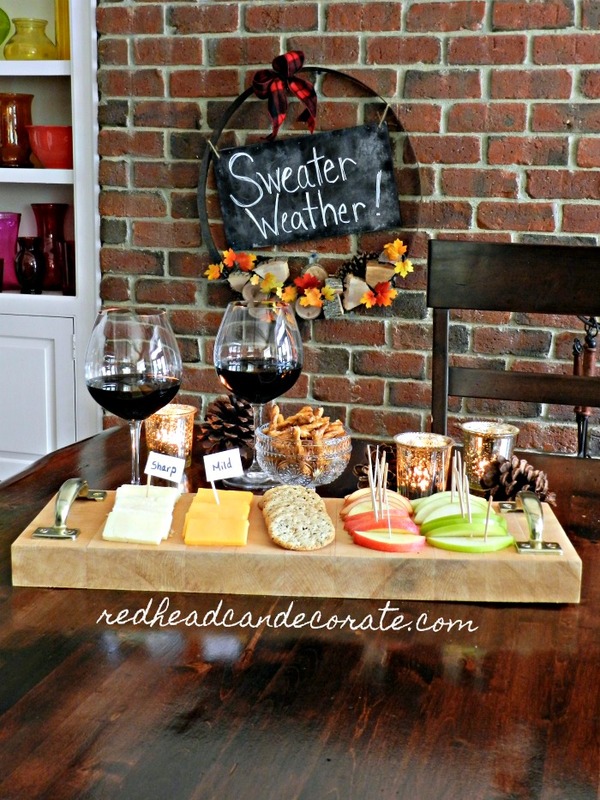 And such a cozy idea for Fall too! What a Great Idea for Apple Harvest Time, love, Dad in NY ps Mom loves it too. Thank you, Dad & Mom! 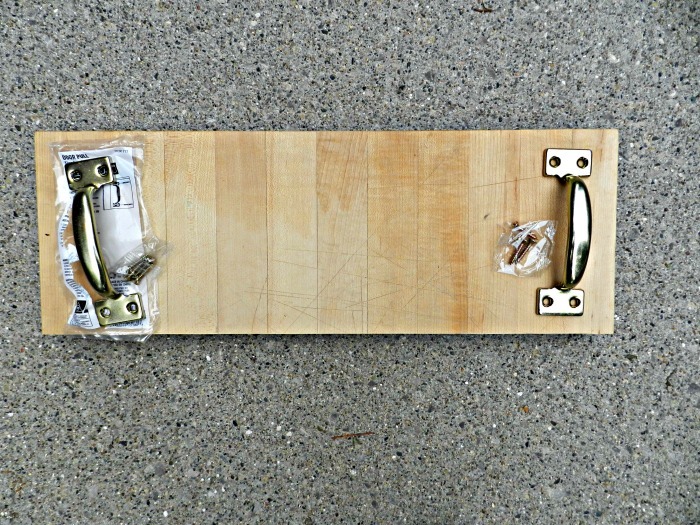 What a great way to repurpose that old butcher block, Julie! I loved the way you styled everything too. Makes me want to enjoy an appetizer with you. Let’s do it, Diane! Oh, and my sisters name is Diane ? Oh I read your blog 🙂 !! 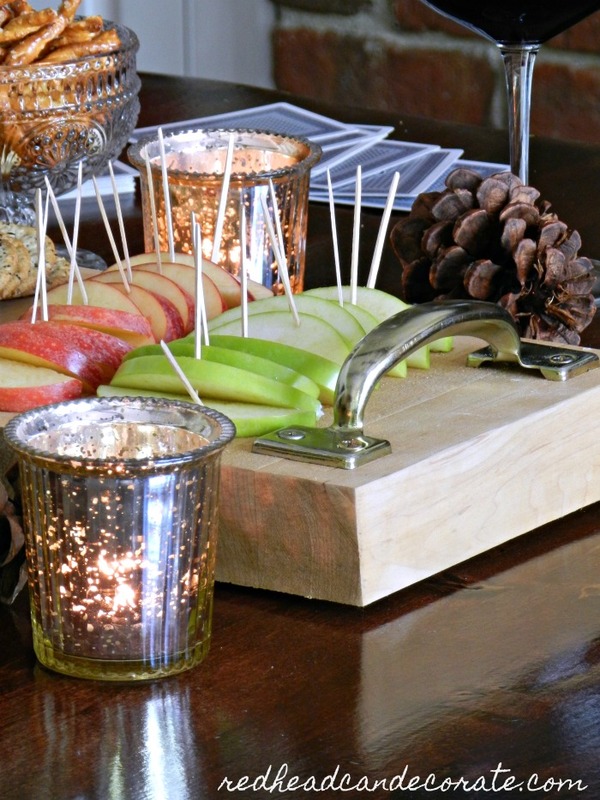 Such a wonderful tray for entertaining in the Fall or any season for that matter! Love your creation and your helper! A brains and brawn team … however, the brawn is quite clever and smart too!!! Yes, it is very sharp!! Ahha!! Yeay!! So happy you read it, Shirley. You are sharp!!! What a nifty, handy dandy cheese tray. Great team work from the both of you. Can’t really go wrong with cheese, apples and crackers. Like your wreath as well which looks like a metal ring from an old whiskey barrel or from an old wagon wheel. Like the rustic look of it. Like your nifty, handy, dandy cheese tray. Great team work from you both. 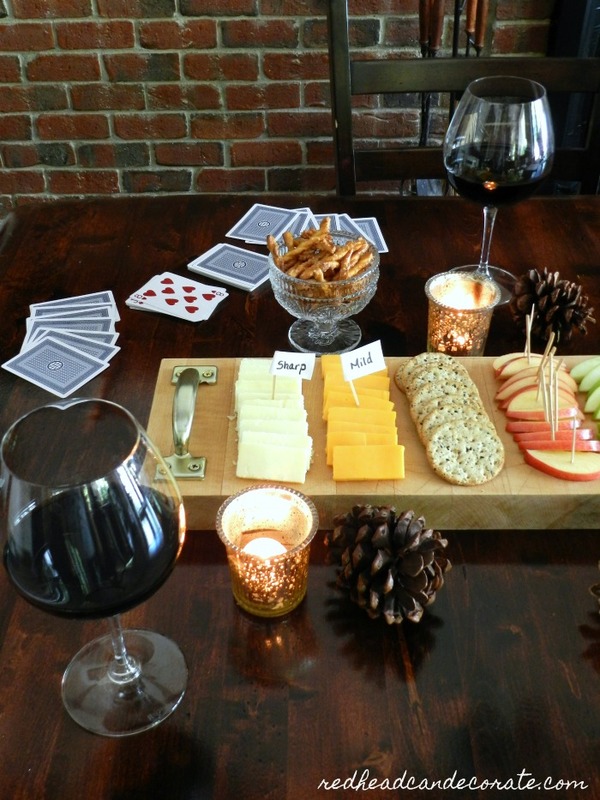 Can’t go wrong with cheese crackers and apple slices along with a nice glass of good wine to top it all off. Like the cool looking handles you adorned your try with. Love the looks of your wreath as well. Looks like a metal ring from and old whiskey barrel or old wagon wheel. Gives me idea for the metal rings I have laying around here. Like your nifty, handy dandy cheese tray. I forgot sausage, Colleen! I also forgot to put a pumkin in there somewhere. My mind is slipping. Must be the wine. Oh and the wreath is coming up Tuesday. U r spot on as usual!! Unable to post my comment earlier cause kept getting error message so thought I would try again now. What size was your butcher tray piece after Mr. cut it? Great question, Beth. Why the heck didn’t I put that in there! It is 20 inches by 7 inches. Are you going to make one? You are right there, mister! I can’t believe this! I have these 2 pieces of butcher block in my garage, from an old portable dishwasher, I was just looking at them the other day I knew there was something I could do with them, now I know. Great idea,thanks. That is so cool!!! Yippee!! Whenever I tried to submit my comment yesterday I kept getting error message so thought I would try again this morning. OMG Julie, this is absolutely fabulous. I love this idea. We have a large butcher block to, I always felt it was to big. Never thought to cut it in half to create this wonderful cheese, fruit and crackers. Tray. You just keep nailing it. Thanks! Hi Ivory!! Those butcher blocks are so heavy aren’t they? They must be made for butchers. Time we changed that!! Have a great week, friend!! Julie you’re all set for fall party with that cute tray! I’m feeling a bit cheesy now! 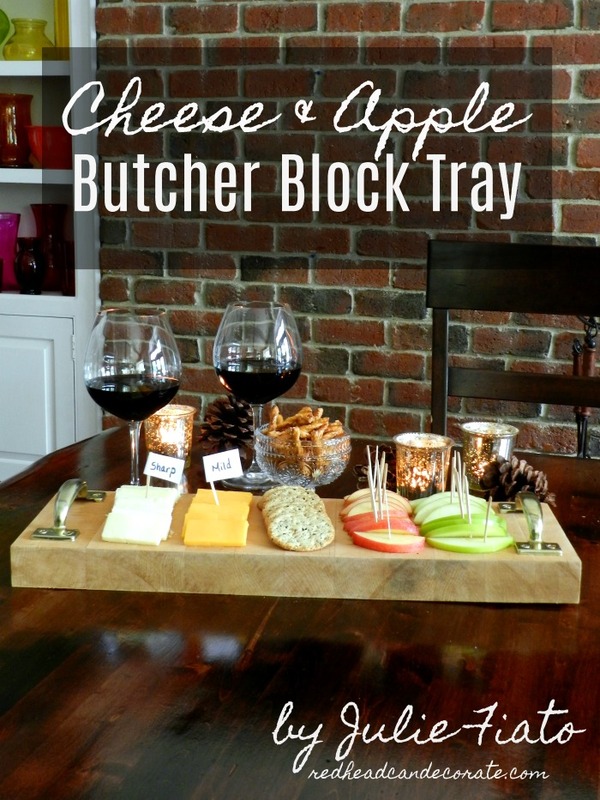 I love your repurposed butcher block tray, Julie, and the styling is delish. Have an awesome autumn, friend.